Wombat's 2018 State of the Phish Report found that nearly this percentage of organizations experienced phishing attacks in 2017, with nearly one-half of surveyed information security professionals adding that the rate of attacks increased from 2016. Fifty-three percent of companies experienced a targeted attack, or spear phishing. About this fraction of respondents to a Sage Growth Partners study said EHRs have failed to deliver promised clinician satisfaction (60%), patient satisfaction (64%), lower costs (76%), or offer better population health management tools (64%). However, about one-half believe EHRs deliver better clinical outcomes (52%), ease of use (51%), and strategic improvements (49%). Research by ScalaMed, a mobile prescription system, found that this percentage of survey respondents said they didn't know where all their medical data are stored. Almost 80% said they should own their own health data, and almost one-half of respondents often feel sidelined in the management of their medical records. According to a TEKsystems survey, this percentage of HIT executives indicated that the HIT department is expected to drive innovation. One-half of organizations have nothing planned during the next year for initiatives such as artificial intelligence and machine learning, but the majority are in various stages of implementing initiatives such as mobile applications and cloud computing. This amount has been approved for the University of Vermont Health Network to upgrade four of its six hospitals to Epic over the next six years, according to FierceHealthcare. 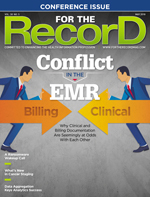 The four facilities currently use several different EHR vendors for ambulatory and inpatient systems. MediaPro found in its 2017 State of Privacy and Security Awareness Report that this percentage of health care employees showed some lack of preparedness with common privacy and security threat scenarios. According to MediaPro's 2017 State of Privacy and Security Awareness Report, approximately this fraction of physicians and other types of direct health care providers showed a lack of phishing e-mail awareness, compared with only 8% of nonprovider employees, including office workers. Additionally, 24% of health care employees had trouble identifying a handful of common signs of malware, which is twice the amount of respondents in the general population survey.